Habit: Plant densely cespitose, 5--30 cm. Leaf: channeled; basal leaves numerous, generally to 1.5--3 mm wide; cauline acute. 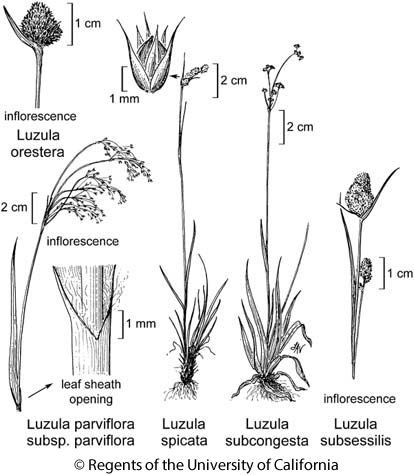 Inflorescence: nodding, generally +- interrupted at base, clusters dense; middle bract lance-ovate, acuminate, membranous; lower bract <= inflorescence, +- green- to brown-membranous. Flower: perianth parts generally 2.2--2.8(3.3) mm, lance-oblong, acuminate, brown; anthers (0.4)0.5--0.6(0.7) mm, +- = filaments. Fruit: valves generally 1.6--2.3 mm, < perianth. Seed: 0.9--1.1 mm, +- 0.6(0.7) mm wide; appendage 0.10--0.15 mm. Chromosomes: 2n=24. Ecology: Alpine slopes, on wind-eroded acidic soils; Elevation: 2900--3700 m. Bioregional Distribution: SNH, Wrn, SNE (Sweetwater Mtns); Distribution Outside California: to Alaska, Montana, Colorado; New York to Maine; circumpolar. Flowering Time: Jul--Aug Note: Variable, further study needed in CA-FP, GB. Citation for this treatment: Jan Kirschner 2012, Luzula spicata, in Jepson Flora Project (eds.) Jepson eFlora, http://ucjeps.berkeley.edu/eflora/eflora_display.php?tid=32168, accessed on April 19, 2019. SNH, Wrn, SNE (Sweetwater Mtns); Markers link to CCH specimen records. Yellow markers indicate records that may provide evidence for eFlora range revision or may have georeferencing or identification issues. Purple markers indicate specimens collected from a garden, greenhouse, or other non-wild location.